You still cannot add line breaks in your cells. What kind of lazy dimwitted programing team cannot code the two lines it would take to add this dealbreaking feature. I mean, how hard is it to comprehend that people need this. This software is as much of a tool as a plastic hammer you give to a toddler so they may not hurt themselves. Unbelievable. Great app, easy to use and great UI. Google products just get better with each update. The iPad app is not user friendly! Operation is too complicated to implement. We use a lot of online apps, but this is a versatile collaborative tool. We’ve appreciated the continual upgrades and stability. Things are intuitive. I use Slack a lot for work, and I can never open important Google Sheets from my iPhone that are shared via Slack. Works well if all you need to do is compute , but the editing for charts and graphs is extremely limited. Nearly useless. Kinda annoying still love spreadsheets tho. 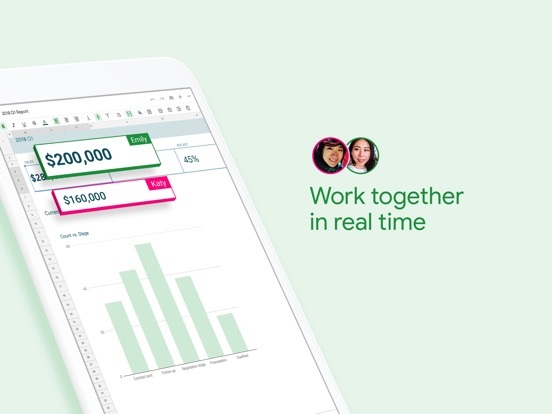 Sheets is an easy-to-use app that works great for any circumstance, whether that be organizing a schedule or keeping track of finances. The formatting is simple and user-friendly. Some functions are removed in the mobile app that are available in the desktop app but overall, it’s a great app for anyone who wishes to stay organized in any area of their life. I’m not able to remove old forms. I’m also not the original creator of the form, it’s sent to me, so it may be that only the originator can remove them. The main reason I use this is to track my workouts and not the file opens but the worksheet looks like all the cells are hidden. Other worksheets are fine and still reference the 'hidden' spreadsheet. I'm not the only one with this issue and it looks like it's a long standing bug. If the problem is going to be ignored, I guess I'll go back to Excel. 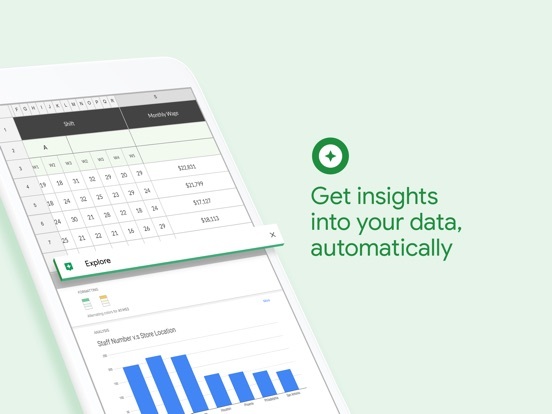 Google Sheets is a good interface to the free, limited version of Excel available for iPhone/iPad (IOS). Did they even try to make a functional application? I love how easily I can access my monthly budget. Works as intended, has never crashed, great to have my Google Sheets with me all the time. Claims the app needs to be updated to open a recent spreadsheet, but the app is fully updated with no newer update available. Can't be used. Can't be counted on for business. I 100% like both versions, but would like the iPad version to work the same way when changing a cell formula or data. The Mac deletes the entire data when you start to change the data so you don’t have to delete each digit, whereas the iPad version just adds it onto what was there. Also when you access a formula in a cell, if you don’t enter each cell you come to with another enter, it creates strange formulas instead of leaving them as they were. Mac version doesn’t do that and is preferred. I love sheets. I have used it in many different ways to track goals, breakdown projects and a lot more. Hide and un hide pages would be nice and change tab color would also be nice. Auto correct isn’t the best and neither does speak to text. Make more like the original spreadsheets excel. You created a sad version of the original. Given that most Network Attached Storage boxes are too easily hacked, I cannot justify the cost of replacing my 12 year old NAS at home. The Google drive with Docs and Sheets is far more secure and cost effective for the long term. I would have given Sheets 5 stars except for my continued frustration that it does not come back to where I left off. Having to scroll down hundreds of lines every time is a waste of my time. Other than having to learn the new formatting commands, I am very happy with Sheets. P.S. I was using DecCalc in the 1970s and Lotus 123 in the 1980s. I have written hundreds of spreadsheets. When I try to open a link to edit for a spreadsheet it suggests to download the app. You do that and the spreadsheet you were trying to reach becomes inaccessible. The only solution I had to this problem was to manually type in the link on a computer or email the link to yourself to be able to open on a computer. This app pisses me off more than any other app on my phone. Despite setting English defaults in my settings, it continues to display in local languages (currently Spanish) whenever I open a sheet online. With only few functions on iPad/iPhone version, I can barely create a sheet. I can make one, but I cannot make it the way I want. I can’t even do the cell auto-sizing (maybe I am too stupid or the app is too complicated to find functions that I want to use). Definitely, recommend MS Excel app. You get some functionality of the desktop version, enough to view sheets and do light additions, but that’s about it. Very limited when it comes to formatting, no tools to limit your cell count or remove gridlines for example. Excel work meet google sheets. App always crashes. I hav to always rush to do what need to do using this app because it’s a letter of time before it shuts down on its own. it always says sheets is offline and ask me go online. but actually i am online, my google drive and google doc app work very well on the same iphone. iOS is not supported with this. It closes out and won’t let me enter info. Its frustrating! It’s impossible to share a Sheets spreadsheet using your Sheets iPhone app because the app freezes and then closes...100% of the time. Please fix this!!! In case this is relevant, I have an iPhone X. While I primarily use sheets to organize my own information and for university projects, it works well for many of the same purposes that excel does. Being the free alternative, sheets is a great online tool to use since you can swap between phone, computer, tablet, etc. 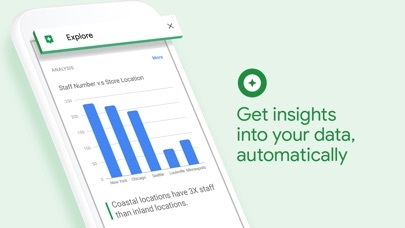 seamlessly and collaborate like on Google Docs. On iPhone it has a fair user interface and does what you’d expect it to. There isn’t really anything you could improve upon on a mobile version of sheets. I like it very much. I think it is easy to use no need to carry any laptop just use a terminal with internet access and you are done. Thanks google! If we could Change wording in abc column heads And personalize each doc would make it near perfect. I’m so grateful for this. Love using Google Sheets for just about everything.... but the mobile app is not perfect. For example, when wanting to add a note in a cell in the mobile app, I can’t actually do it! I can only do comments. This app crashes constantly. You’ll be able to use it for a minute at most before it crashes. Don’t waste your time. Just what I was looking for. Not interested in paying microsoft money for excel any more. A great way to keep financial and personal activities in ledger form. I use this for expense management from my phone. I love it! I use this for work and it’s fabulous!!! Google Sheets are practically useless within iOS. In my case, on an iPad Pro. Google has not made the following features available on the iPad version (they do, however, function on Android Tablets): -No Keyboard Shortcuts for Copy, Paste, or Fill Down. -No possibility for Paste Special (to paste a formula result as text). -GSheets crashes when attempting to resize column width. -Can’t copy and paste a table from Google Sheets into Gmail. From an engineer’s perspective the product is useless on the iPad. As much as i love using sheets on other platforms, it’s interface on ios is dysfunctional at best. Example: i want to enter time to track my blood sugar in a simple sheet. So, first day (second row) i make an entry 7:00 am. No formula, plain text. Next day when i try to enter the text under the column, next row, it takes it as 7:00:00 am or won’t let me edit; alphabets disappear from keyboard and only numerical values show up. Simple data entry is a headache! 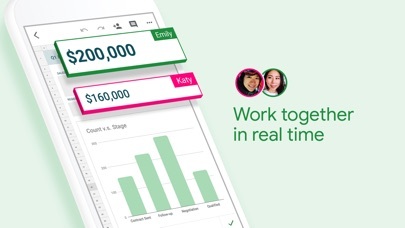 This app is easy to use and makes collaborating on spreadsheets easy. I highly recommend it. I use sheets to share with my running groups to log their miles and I use it for all my personal and business spreadsheets! It’s great that I can have it on my phone as an app and have it on my computer!! it seams easier to upload an excel to google sheet than an excel to an internet server. access is restricted to users you share with. compatibility less of an issue since no matter if user is on desktop or mobile windows or mac android or ipad/phone. Basic editing but works well on mobile phone on the run analyzing data and cut/paste into calendar events. Love this app. I open this app 10 times or more in a given day to redeem or see how many we have sold etc. nice way to track your sold item. ...the one where the touch model diverges completely from the display model. Come on guys, it’s been forever. Very easy to use and I highly recommend this App. Awesome app to keep my finances in check. Worked extremely well for me. I really love this app but with recent updates, the mobile app seems a bit buggy. I keep track of my banking with it and going between an iPad and my phone, something always changes. Cells are deleted or moved around. Makes it very annoying and inconvenient. Love the way it integrates the work with others. Also very simple to use and share with other people. Only thing it lacks is that when it prints with iPad it does not print accurately as it appears on the screen. WYSIWYG rendering is still in development in my opinion for printing. However, it is still an excellent alternative to Microsoft products and the gap is coming very close to the giant in the history of document making. Thank you so much for making this available and affordable for everyone~~! I don’t use the spreadsheet like a mathematics expert, so I can’t share on numbers in columns — EXCEPT when I try to put numbers in columns and the app tries to convert them into something I didn’t type! Like dates, or money, or something I didn’t ask for. Take the “automated” feature out, and you’ve got something! I’m sorry that I don’t know how to turn automatic features off, and it’s annoying. I AM GLAD to be able to make a rough spreadsheet for names, addresses and such... or, a chart that can be cut/pasted into a power point ... YES, I try to move back and forth between Google and Microsoft products, ON MY APPLE DEVICES! YES, you guessed it... I have ADHD-I. But if anyone can MAKE IT WORK, it’s me! A great product for free! It’s Google’s FREE APPS, free e-mail, and FREE G-drive that keeps me coming back to learn more of what Google can do for me! 4 ⭐️ because I don’t like automated conversions without my permission. I love the ability to access my spreadsheets on the go! This is so easy so quick linear. I use for invoices for taxes. Far better than Excel. Everything from Google is a panacea! Thanks, designers & managers!! Have used other excel programs . This is more user friendly! Love using for work and personal projects. Helps to get super organized! While it’s my natural instinct to be leery of trusting a company that proports itself to be altruistic in its relation with its clients; it remains hard to fault the company when it comes to their free line of productivity tools. Sheets is still the “poor-man’s” Excel. It has a much leaner featureset, a simplified interface, and some annoyingly useful widgets and extensions. Basically, it’s Excel for people who normally use Excel. People who are savvy enough to even know about Excel, tend to use it as a basic way of displaying and organizing data in tables, with some simple arithmetic formulas between cells. The really nitty-gritty features that make Excel so powerful are used by a tiny of fraction of people who are, themselves, a tiny fraction of the general, computer-using public. You can still make a good household budget with automated cells or a business proposal with some formula-based forecasting. If you are mad that can’t use seudo-SQL functions and set up batch processes for huge datasets, you’re probably looking at the wrong, free app. For a mobile app it works ok. A lot more functional on my computer and iPad than my iPhone X. As powerful as my cell phone is, I expect a bit more. Make all the functions available. I use this primarily for my monthly budget and it is difficult to change the functions of a box when all you can do it add numbers and not enter more complex calculations for each box. That is my only complaint besides the usual crashing and instability issues. It could flow a little easier and have the calculations as a ready part of setting up the spreadsheet instead of reinventing the wheel so to speak. Make it intuitive so people with out an mba can manage their budget by setting this up for themselves. I have done this for many people and my hope is that they follow through with it, but if I’m having a difficult time, I imagine others that just use my template, probably just give up if they can’t make easy changes with the mobile version because it never dawns on them to go back to the computer to make them. I have gone PC free for 6 months now, and I replaced Quicken by creating my own program on Google Sheets, which I have nicknamed “Quickenish”. Works GREAT! It didn’t take very long for me to learn to migrate my Excel skills to Google Sheets. I have online stock quotes automatically pushed into cells from one book to another, and formulas push data from one sheet to another, and the whole system works remarkably well. I love that I can access from phone or IPad, as well as access offline when I am away from a network connection. I can even enter data offline and it will sync automatically next time I open with a network connection. My Quickenish has no categories or budget, but hey, it’s free! Worst con: slow to enter data after tabbing over a cell, but maybe that’s my devices? I use (and adore) Tecknet mini keyboard with my IPad mini. Google sheets my excel for private use. It is very reliable and works well. Especially for using from multiple devices from multiple locations. From a functionality perspective one thing puts Google Sheets above excel is its support for Unicode making it work well for non-English data. Once disappointment to date has been that it is either matching or lagging Microsoft Excel mostly. I say this without claiming to be an expert who has used its entire functionality, so take that with a pinch of salt. I would like to see Google team taking us in to a new world of functionality and capability - for example, seamless working between documents, databases, multimedia, and presentations. I would be glad to talk to Google Office team, if interested. Love this App!! Very convenient and I can access it on any device!! I have had past experiences where I had other apps for a while and without any warning at all from the Developer, the app was no longer available or was not compatible with the newest software so this left me High and Dry!! Very frustrating when you have to re-do all the information over again and find the info from many different places!! So the only advice I can give to the Developer of the Apps is to please let the people know when your no longer going to have the App available for us to retrieve our information so we can at least store it somewhere else so it’s not completely lost and we have to start everything over. 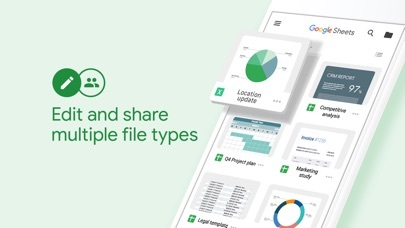 Google drive is already my go-to for documents and spreadsheets (I don’t really use slideshows, but if I ever need to, it’s the default for me there too). I don’t edit my sheets too often on mobile, as it’s simply much easier to use the desktop site, but it’s great for viewing. The desktop site has it’s issues. Merged cells are impossible to move accurately in any direction but upward, zooming makes lines appear between and within cells that only disappear once reloaded, or zoomed back to 100%, but reappear upon scrolling. But, those aren’t present on the app. The only complaint I have for the app is the ease of use, but a mouse and keyboard will always be easier to use than just a touch-screen. This and sheets on the computer browser will frustrate some people a bit if they are used to Excel. But I find sheets and drive to be light years ahead of whatever Microsoft is cooking up to compete. I can’t live without mobile access to my spreadsheets anymore. And holy crap, collaboration will never be the same. Microsoft has nothing on google. I cringe when people share an xls spreadsheet back and forth. Lol. Especially when it’s shared through google drive. Seriously saw that. Wow. Nice try, but you missed the fact that there is a better way. And so, so much easier. And you can actually work together instead of checking to see if the other person has it opened and not saved. Adjusted column size (which never really worked right), but this time the blue line indicating the new column persisted while I did further edits. 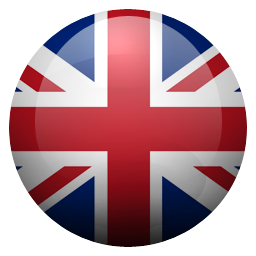 Saved, exited, reopened. Spreadsheet empty — Two months of work is gone. Scary. Data can’t be duplicated. I thought we were past the old PC trick of continuously needing to make copies to protect the data. With other spreadsheets I have lost my work when the device failed, which is why I switched to the “Google Sheets” distributed spreadsheet, but I never lost all my work because of bugs in the spreadsheet - now I have. Googles casual view of data loss means I need to go back to a real spreadsheet, and find another method to view from multiple devices. Both google sheets and google docs really seem to not work with iOS. 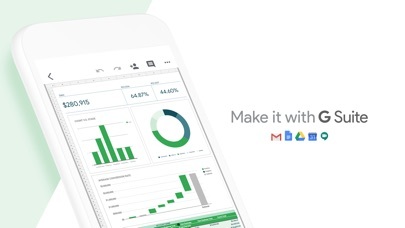 Now Google Sheets feels like Google Docs. 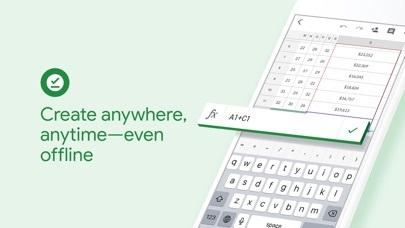 I type with my keyboard on any other app no problem but when I do it on google sheets it doesn’t recognize a handful of keystrokes like the letter “e,” “r,” and “n.” Trying to get a cell to open and respond is the worst. It doesn’t work like its web counterpart. it would be so simple if it did. You press enter to open the cell and you press up to go to the beginning of the cell while still being lock in the cell until you press enter again. When you do that on the Google Sheets iOS app cancels everything your doing and you go up to the next cell. If you press enter and start typing it deletes everything in the cell with what you started tying. I used to love being able to write on google docs but copy and paste and selecting on iPad feels almost impossible. It’s excruciatingly annoying. Over all, it’s a really good app. It’s very convenient to have access to my spreadsheets on my phone, but I really wish the app had the same functionality with setting up equations as the desktop version does. It’s really annoying to have to enter my equation into each individual field and mark that I’m done before being able to move onto the next one. I’d like to be able to enter one, then click the corner and drag it into any additional fields I need. I am also displeased they took away requiring a passcode to enter the app. I have things in there I don’t want my daughter to see and she uses my phone sometimes. If it’s passcode protected, then I don’t have to worry. Needed an excel spreadsheet app and this is by far the better option at the moment. Unlike the other excel apps that you need to fork over money and yet have compatibility issues between the printer or even while using it, this one is quick and easy between devices. I use this for my clients for setting up their weekly workout schedule and emailing it without any hassle like crashing. Recently started using it for making “range-table” cards for F-Class long distance shooting at the range. Overall, I’m very pleased with the functionality. The only downside is that I wish I gotten this App sooner and had saved the money on the other mediocre version. I’ve been using Google Sheets for years. I’m not an absolute expert but I’ve been able to create a comprehensive Google Sheets financial workbook to chart my family and business finances as well as a product inventory workbook. My greatest of challenges has to do with knowing how to use Google Sheets effectively on different devices. I work with them on my messed up Pixel XL phone (that keeps rebooting daily), iPhones, iPads (large and small), and my Windows desktop. Unfortunately I can’t seem to find tutorials to assist me in accomplishing functions for my product inventory workbook that I see others achieving. If you know of resources that would help certainly let me know. Nearly impossible to use. I use fairly large sheets to keep track of my projects. I was trying to update one today on my iPad and I had to re-enter the values on nearly every changed cell TWICE because either it would glitch or not type as I was typing. I also use a sheet that updates based on a sheet of a friend of mine's and in the sheet app it just DOESN'T work at all. I have to look at it in the browser. But you can't edit sheets in the browser on chrome for some reason??????? Drive site crashed like 5 times trying to just open a sheet on chrome so I can edit it. Sheet would not update with new values from my friends sheet in the app. I am fully engrained in the Google ecosystem for all my easy documentation storage but sheets on iPad is by far the WORST Google app I have ever used to the point I'm here complaining. It just doesn't work. If college taught me anything, it’s that Google’s FREE alternatives to Microsoft Office programs are AMAZING. It’s not that there’s more features, it’s simply the simplicity. I don’t need to be an advanced programmer in order to figure out how to do things within Sheets. Even if I don’t know, a quick google search results in a very simple step by step guide by google that cuts right to the chase. It’s easy to collaborate, too. Simply add the person/people’s email address(es) and they’ll be sent a link that will let them access the sheet, and you can give them specific permissions, or you can just create a shareable link. Of all the concepts to survive the desktop to mobile shift in our computing lives, none of them make less sense to me than trying to create spreadsheets on a touch screen. It’s just a task that benefits from the percussion of a mouse and the wide screens of desktop machines so much. Yet, google sheets tries to get this right and mostly succeeds. You’re still going to make lots of errors and be frustrated by the nested menus of settings but the tight integration with google drive, impressive feature set and collaborative capabilities makes this a great solution for minor spreadsheet edits and reference. This app is great! It allows me to read and edit anything that I have created in Google sheets online. It doesn't have the functionality that the online program on the phone but it still works well to allow me to do what I need to do. When computers are not available this app is a lifesaver. I have one thing to note. When printing a spreadsheet sometimes it will try to make it fit on one page and I can't alter that direction, making the data minuscule. Biggest issue is when I want to search for data. The search function does not do all I would like it to do. Hope that issue is fixed soon. Excellent spreadsheet app for when one is on the go! 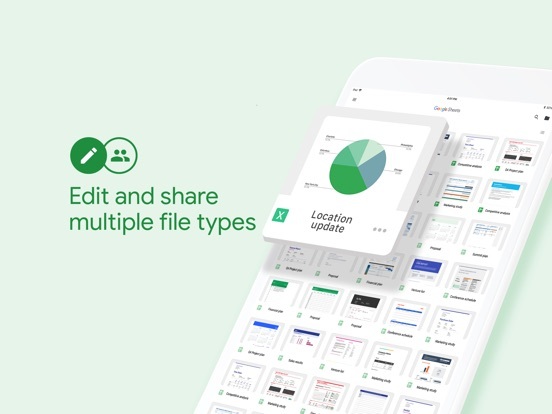 Full spreadsheet functionality from one’s smartphone, with access to all spreadsheet files (“Google Sheets”) which one has saved on Google Drive. Contrary to another review, which stated that only numbers could be edited and complex formulas could not be altered, this app allows any desired change to be made to each cell, just the same as from a desktop or laptop computer’s Google Sheets web interface. Possibly the other reviewer did not notice that toggling between numbers and letters is possible when editing each cell! By far more of a google fan than apple, (even though I have an iPad) and really enjoy having my google spreadsheets and other stuff on my iPad. When you use the mobile version of google’s apps, you still get all of the main features of the desktop version. Google does good at incorporating all the desktop features into the mobile app, while it is still extremely easy to use. Sometimes I even prefer the mobile app instead, because of its easy-to-use interface, and most of the desktop features are still there. GREAT App that Synchs to All my Devices! I love this App. It allows me to make additions to any device of mine that I might be using (computer; iphone; ipad). I primarily use Sheets for language study — and what is great about it, is that there is never confusion, even when mixing 2 different alphabets (ie, Hebrew has it’s own alphabet that goes from right-to-left, which is opposite to that for English). It takes a little getting used to re learning how to alter settings on an ipad — but once you learn this, it becomes VERY easy to customize any list exactly the way you want it — so I LOVE this app! Thank you! It’s awesome to be able to access my spreadsheets anywhere, anytime. I’ve completely converted all of my personal spreadsheets to Google Sheets. My only complaint is, editing spreadsheets on the phone is cumbersome, especially when editing a cell that contains a function. After placing my cursor at the point where I want to type, the contents of the edit field are moved so that the cursor is at the far left edge of the field. As I type, the cursor stays in this location, meaning that I can’t see what I’m typing as I type it. This seems to be a bug in the form field control. Wish this could be fixed. I use this for so many things - handy to use between my laptop and iPhone. More than one of us can edit the worksheets at the same time. I use it to track finances, a daily plan/schedule for my move from one state to another, a log of test results and actions I take to maintain my pool that I can reference at the store, a roster and schedule for coordinating volunteer sports activities, vacation plans I can reference on the go, a noble to do list that my wife and I can share, and tracking the family budget. It is not as powerful as MS Excel, but plenty useful for what I need. Pros-This app has made my life really easy being able to track several metrics on all of my devices. When I am on the go I can update from my phone or tablet and then once I’m home or at the office, I can continue to update, analyze, then print once ready. Cons- Wish that it would open to the last cell modified. One spreadsheet that I use has over 15,000 rows and I have to scroll to the bottom to get to the new data and update which takes some time. It would be nice to have it open where I left off. Definitely like the app. Interface is intuitive. Does everything the average user would want it to do. However, I give it 4 stars because it won’t run script. I’ve created buttons that when clicked, causes a cell to increase in value by x amount or decrease by the same amount; the same buttons, when you open the file in the app, do not function in the same way. Instead it treats the buttons as just images. You can’t access script editor on this app either. Would be cool if you could allow the app to run custom scripts and create/edit script. Google sheets is the worst app ever! My life was easy until I downloaded google sheets. Not only does it mess up the split window on my iPad Pro, it even messed up google drive. Using google sheets is the equivalent of putting another hole in my head! The app it works worst with is google drive! How does that make sense? Google drive is easily navigated until sheets or other apps are also introduced, then navigating them becomes less discernible than interstate spaghetti bowls. Google sheets is so horrible I’m going to ditch google drive and every other app google offers. All any of them do is get in the way! Google maps is the second worst! Wait, I forgot about Chrome, what a computer overloading pile of dog crap! The world will be a better place when google is removed from it! I very much dislike the new design. The old one was sleek and professional, and I enjoyed its minimalism. The new one looks like someone hired their middle school nephew to make it in six months, he put it off until the last three days, and the result is this dumpster fire of a UI design. The new button animations make the app seem slower to react, every pop up and menu is huge and clunky, and there is way too much blank space. I don’t really use the word ‘hate’. I feel it’s too strong. But I feel I could pull it out and try it on, just this once. This update deserves it. If you’ve already been working on a sheet, it will pull it from your drive. If you start a brand new sheet, it’s okay. I often see that it doesn’t send the sheet created in the app back to my drive for access on a computer. My biggest complaint is that I can’t open a sheet that someone else has started and shared a link for. If someone sends a link through a messaging app, it won’t open (or give the option) to open in the sheets app. Instead it prompts me to download the app, which I already have, and when it finally opens the app from the App Store it’s “forgotten” about the shared sheet I was trying to open. I use this everyday and almost all day. If I didn’t have google sheets I wouldn’t be able to keep things organized in the business I run. I also love that you can see others and share with others. Such a great platform. On a side note- it does sometimes run slow and freeze with a large amount of people running a shared document. It sometimes makes me reload and refresh and I understand having to but wish it wasn’t so often. Also, at times it can overwrite others’ text. Like I said overall great program and so grateful! I’m not sure if it’s an issue with my iPhone X or the app itself, but since getting the X I’ve been experiencing major slowdowns after applying color to cells. I recall it only happening once a long time ago on my 7+ but it’s more frequent on the X. A force close resolves the issue, but would be nice to do away with the issue entirely. Occasionally the copy/cut function doesn’t transfer the contents when swapping sheets, but that one’s not as annoying as the app slowing down entirely. Glitch fixed - Thanks. Must have been temporary bug of some sort. Had written that “mathematical functions no longer work, AT ALL, within chart. Help!! Results are all kerflooey. 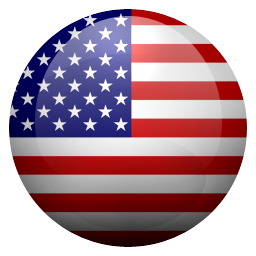 Has app been hacked?” Original review - Love this free app (no ads.). Very intuitive, especially if you're a bit geeky. Very simple to make multiple small spreadsheets on one page, and perform simple calculations within them. Pages are enormous, with room for lots of side by side charts. 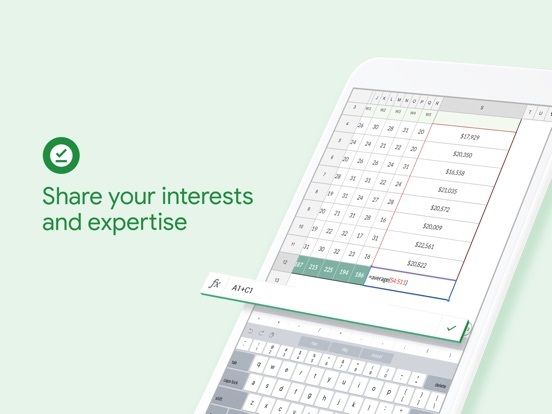 Useful for keeping track of expenses, payments, accounts, taxes, in a manner that's useful for you, I.e. with columns and headings you want. On your own, if you're so inclined, you can create a functional checkbook and calendar - much better than any app's. Results are saved to your different iOS devices, so that you have access to them if you have only your phone with you. Thank you. I’m a music teacher and I use this app on my iPad and iPhone to maintain records on my students’ progress. For the most part I am happy with it because it is convenient, easy to access, and easy to use. However, the app has a tendency to crash from time to time and to freeze on a page—when this happens, the frozen page persists even after force closing the app several times. There’s also something a little clunky about the way it inputs text—it’s slow and randomly drops every few letters I type. I still think it’s a good app, but hope Google sorts out these glitches! The app itself works great, but whenever I click on a link from an email or something it opens in Safari which then requires you to use the app, which doesn’t directly bring you to the app but to the App Store, and when you open the app from the App Store it goes to the homepage first where you then click the new file. It would be nice if there were a setting that would default open to the clicked file in Sheets directly. I love the google workspace, docs, sheets, slides, etc... however at the moment it has a couple hitches, especially because I use it a lot for classwork, and we are permitted to use iPads in class. So in some instances, computer only features such as deleting cells and customization of graphs would make completing assignments much easier if they were implemented into the app. Also, at the moment I am unable to open some of my documents on my device as it says the app needs to be updated, yet my app is up to date. I enjoy using sheets for anything that benefits from sharing for whatever reason. It makes it easy and super convenient to have an editable copy on all my devices! Plus, now my husband has no excuses. If it’s something he should see or keep track of as well, I just share it, and he can see/edit it also! However, I think my favorite feature is the formatting of alternating colors per line. I need things, pretty, neat, and organized, and this accomplishes all 3! I use to work with Excel daily at work. I have been retired for a few years and started using Google sheets. 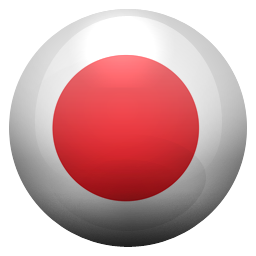 This program helps me keep track of all the things I did before but is a lot easier to use. It works with all my devices. I use it seamlessly between an iPad, a MacBook Air, Asus Chromebook and a Pc. I can use any device to edited my spreadsheets and this is very convenient. I feel this program is indispensable for my workflow and would be lost without it. This app, like all of Google’s iOS apps I’ve tried, is missing lots of features that the web app has—even basics like the ability to type special characters. The interface is difficult to use, many features and functions are missing, and interactions are difficult. Simple actions like copy/paste and selecting cells don’t work well or even reliably. From any other company this app would be an embarrassment, but how else can you use Sheets on iPad? You’re stuck with Google’s poorly designed, poorly implemented, poorly supported app. Anything from Google is great. Every program I’ve used from them is bullet proof and and they listen to their users. I have been working with software for the past 30 years. You can look long and hard but we very hard to find a company that cares as much as Google. The app is very simple and it has been upgraded several times and has never crashed in the years I’ve used it. Google sheets is outstanding. 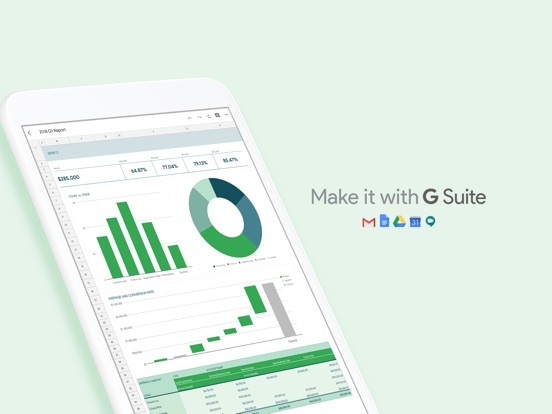 Google Sheets (and the rest of their office products) work very well through a browser on MacOS, however with each update Google seems to be crippling the iOS versions (Sheets, Docs, Slides). Cut-and-paste with keyboard shortcuts used to work, now don't (and haven't been fixed despite several updates). Entering text in a spreadsheet cell bounces the screen distractingly up and down and then erases the contents in the cell fairly consistently. Features disappear from one version to the next. Unfortunately, now I cannot use iOS Chrome to access documents (I could before). I can't imagine the smart and talented engineers at Google are crippling their own iOS app, but it sure seems like it. This app is fantastic! I use it to keep track of my exercise, my calories and food throughout the day. I can see my progress on any of my devices from my phone, to my iPad, to my computer it is great. It is simple and easy to use and quick to pick up. I wish I could use my Apple Pencil to write quicker but it is still fantastic. I would also like to see it easier to switch from page to page on my Ipad. It is a phenomenal app for school, work projects and even person uses. I would highly recommend. Shanghai Fengge Information Technology Co., Ltd.